The Pretenders - Greatest Hits has received mixed reviews, as the retrospective isn't exactly comprehensive but it nevertheless provides a decent overview of the band's career. The DVD contains a mix of music videos and live cuts. The Pretenders take an acoustic turn in The Isle of View , from a 1995 concert in London. Fans have been positive about this performance, although those who prefer the hard-edge Pretenders sound should instead get Loose In L.A. , a lengthy concert from Wiltern Theatre in 2003. Live from New York City is a Sony Music Studios concert from 1998. Hynde launched a solo career in 2014, and the Pretenders were dormant as a band between 2012 and 2016. However, The Pretenders are once again active, having issued an album and toured in 2016. In 1985, the band (including Black) played at Live Aid but further upheavals were to come. Soon after recording sessions for the next album began and one track had been completed, Hynde declared that Chambers was no longer playing well and dismissed him. Discouraged at the loss of his bandmate, Foster quit (“My whole argument was that Martin Chambers was the rhythm section of the Pretenders and it didn't really matter who was playing bass. So I just said I didn't want to be involved any more.”) Hynde and McIntosh recorded the rest of the album in various sessions in New York and Stockholm with assorted session musicians including Carlos Alomar, Bernie Worrell (P-Funk) and sometime Eurythmics bassist Chucho Merchan. Towards the end of the sessions, Hynde hired two of the guest players - bassist T.M. Stevens and ex-Haircut One Hundred drummer Blair Cunningham - as the new Pretenders rhythm section. The Get Close album was released in 1986; the disc included the Top 10 singles "Don't Get Me Wrong" (helped by a popular video homage to the television series The Avengers) and "Hymn to Her" a No. 8 success in the UK. In the US, both "Don't Get Me Wrong" and "My Baby" reached #1 on Billboards Mainstream Rock chart. Two new non-album songs, "If There Was a Man" and "Where Has Everybody Gone?" were released on the soundtrack of the Bond film The Living Daylights and were used instrumentally by John Barry in several scenes. For the Get Close tour, Bernie Worrell was added to the live lineup on keyboards, meaning that the band now featured three African-American musicians with a strong background in rhythm-and-blues, funk and soul. To Hynde's dismay this drastically altered the band's sound from its New Wave rock roots, and she realised that she was now fronting a new band that was "not Pretenders". Part way into the tour, she took drastic action: Stevens and Worrell were both sacked, Malcolm Foster was reinstated on bass, and Rupert Black returned on keyboards. Pretenders joined with Emmylou Harris on Return of the Grievous Angel: A Tribute to Gram Parsons, performing the song "She". A Greatest Hits compilation followed in 2000. During 2002 Loose Screw was released by Artemis Records. It was the first Pretenders record to be released by a company other than WEA. Rolling Stone noted its "refinement, stylish melodies and vocal fireworks," while Blender called it "slick, snarky pop with flashes of brilliance". Pretenders' album Break Up the Concrete was released through Shangri-La Music on 7 October 2008. It was the band's first Top 40 album in the US in twenty two years, and its last to date. Tracks include "Boots of Chinese Plastic", "Don't Cut Your Hair", "Love's a Mystery", "The Last Ride" and "Almost Perfect". With Hynde was the guitarist James Walbourne, pedal steel player Eric Heywood, bassist Nick Wilkinson and drummer Jim Keltner (on the album only). Chambers returned to the drums on tour with the band. Several one-off shows were performed during the closing months of 2008, including a couple of Christmas charity shows. The 'Break Up The Concrete Tour' began in mid-January and covered most of the United States, with shows until the end of March. It then continued in Europe, with gigs in Sweden, Norway, Finland, Denmark, Germany, the Netherlands, France, Spain, Belgium and the UK during June and July, before returning for a new tour in Canada and the US during August and September 2009. 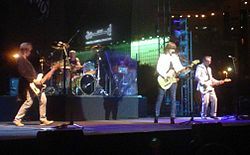 A show from the tour, filmed at Shepherd's Bush Empire in London on 15 July 2009, was released on CD with bonus DVD / Blu-ray on 9 February 2010, titled Pretenders: Live in London. Another tour was announced in May, a double headlining tour in New Zealand and Australia with Blondie for a few capital city and winery shows. On September 6, 2016 Stevie Nicks announced that the Pretenders would tour with her on a 27 city tour for the last three months of 2016. The live band consisted of Hynde, Chambers, Heywood, Walbourne, Wilkinson, as before. The Pretenders released their new album, Alone, on October 21, 2016. However, Hynde was the only Pretender on the album, which was otherwise played entirely by session musicians. ^ a b Lyndsey Havens (2016-09-06). "Stevie Nicks Announces Joint Tour with The Pretenders". Billboard. Retrieved 2016-09-12. ^ Peter Buckley, The Rough Guide to Rock, page 813. Rough Guides, 2003, ISBN 1-84353-105-4. Retrieved 8 November 2009. ^ Miles,The Pretenders by Miles, page 20. Omnibus Press,1980, ISBN 0-86001-802-4. ^ Deanna R. Adams, Rock 'n' roll and the Cleveland connection, page 396. Kent State University Press, 2002, ISBN 0-87338-691-4. Retrieved 8 November 2009. ^ "Pretender to the Throne". Billboard Magazine. 29 May 2004. p. 65. Retrieved 2014-06-09. ^ "Critic Reviews for Loose Screw". Metacritic. 2002-11-12. Retrieved 2014-04-19. ^ "Neil Young News: Pretenders Inducted into Rock and Roll Hall of Fame by Neil Young". Thrasherswheat.org. 2005-03-15. Retrieved 2014-04-19. ^ "2014 Off Track Entertainment highlights". Singaporegp.sg. Retrieved 2014-04-19. Pretenders is not currently on tour.